Merry Christmas!!! ‘Tis the season of our Savior! Missoula is so beautiful at this time of year. A lot of people put up Christmas lights and decorations, and city made the downtown area very festive. As I see the Christmas lights lighting up the night sky, I am reminded of the day, night, and day that were one day in the Book of Mormon at the time of Christ’s birth. My thoughts have also been drifting back to the connection of Christmas and Easter. I love this quote from President Hinkley: “I bear witness [of] the Atonement of the Lord Jesus Christ. Without it life is meaningless. […] The sorrow of death is softened with the promise of the Resurrection. There would be no Christmas if there were no Easter.” I hope you all take a moment to reflect on Christ’s Atonement this Christmas. I know that Christ was born to this Earth, and that he lives today! And that means for my life that I will live again and one day be like Him. Well, like I mentioned last week, we had transfers this week and I stayed and got a new companion, Sister Moore. She’s been in the field now for about 6 weeks, and I will finish training her for the next 6 weeks. She is from Houston, TX and she’s 22 years old like me. Since I’ve been in and around Houston so much, we’ve been able to connect about random places that we’ve both been. The last few days with Sister Randall were really good. 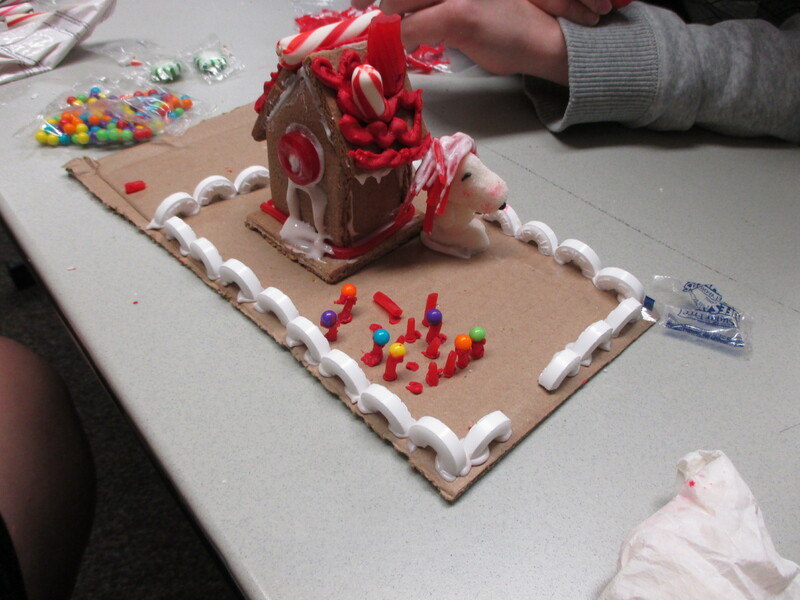 Last Monday, we made gingerbread houses for FHE! Some of the guys in our ward thought it would be funny to made a gingerbread graveyard instead for theirs…. oh goodness, haha. 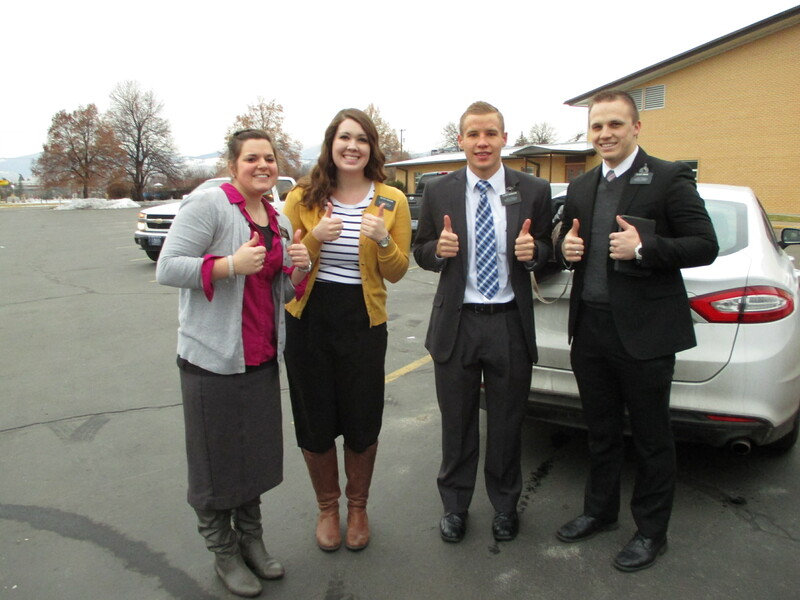 The transfer happened on Wednesday, and Sister Randall left on the “outgoing van”, so I had to wait about 4 hours for the “incoming van” to bring Sister Moore. In that time, I got to be temporary companions with Sister Jones again!! So fun. We cleaned and organized our room like mad so that it would be neat for Sister Moore. Why have I accumulated so much junk on my mission?? Sister Moore got in around 4pm, so we dropped off her stuff and then hit the pavement! Ok, so here’s a miracle! Karen is getting baptized this Sunday!!!!!! Finally!! I know I say this everytime, but I really feel like I’m in Missoula for her. We had a lesson yesterday, and she told us that Saturday wasn’t going to work after all for her baptism because she had to work. But she said that she really didn’t want to move it back either. So basically at the same time, we both receive the inspiration from the Holy Ghost that told us… “why not Sunday morning right before church?”. So that’s what we’re going to do! She’s having her baptism interview tonight at FHE, and then she’ll be all set. I am so grateful for the opportunity to have been with her from the start of her conversion. Here is our other miracle for this week! All week, we have been tracting up a storm with the He is the Gift cards and video. We’d been able to show it to people, but no one had been really all that interested. On Sunday, I suddenly realized that we hadn’t been praying about where to tract- we were just going where-ever. So I included that in my morning prayer, and some less-active girls in our ward popped into my head. And I realized that it was their apartment complex that was where we needed to be. So Sunday night, we had a little over an hour to do some tracting. We drove over there and when we arrived I got a scared, weird feeling, especially because of the “no soliciting” sign (we’re not solicitors though!). I decided to park anyways, and we offered a prayer to see if we should stay. Both Sister Moore and I got a strong confirmation to stay. So we started with the nearest apartment, and we saw amazing success! In that one hour of tracting, we had eleven OYMs (Open Your Mouths- a gospel centered conversation), TWO new investigators (both of which are YSA! ), and a potential family of four. We are feeling so blessed right now. It really reminded me to always act on promptings, and if there is doubt, just pray about it! In my very first interview with President Mecham back in November 2013, he told me, “If it is good, and if it could bring someone closer to Christ… then do it!”. I am so excited for Christmas! We are having District Meeting on Christmas Eve, so that will be special. I think I’ll make some cranberry bread or something to share. We are having Christmas Eve with a family in fourth ward that I haven’t met actually, but the Elders know them and said that it will be great. Then we have Christmas breakfast with a single mom from fourth ward, and Christmas Dinner with the Kershaw family from fourth ward! The Kershaws feed us 1 to 2 times a week, and they are just the best, so we’re excited to get to spend Christmas with them. Other than that, our day is kinda up in the air. We’ll see what the Lord ends up needing us to do! I love you all sooooo much!!!!! I hope you have an amazing Christmas. ← And a partridge in a pear tree!